THE FOREST WAS GROWING COLD. MAMA SAID SOON IT WOULD BE TIME TO SLEEP. BUT ALL MAURICE COULD THINK ABOUT WAS HIS FIRST SPRING. Everyone says that Spring will be something really special. But Mama says he has to lie down and hibernate first. How can little Maurice sleep when all he can think about is this wonderful thing called Spring? Like a kid on Christmas Eve, Maurice can't sleep. Mama Bear snores on, but her cub steals outside to see if Spring has come yet. It hasn't. At least, everything looks the same, and Squirrel and Robin and the rest all say it's going to be quite a while before he sees Spring. Maurice wanders through the forest, noting the changing smell of the wind and windblown leaves falling all around him. But then something else falls from above. MAURICE FELT AN ICY STING ON HIS NOSE. A BEAUTIFUL CRYSTAL LANDED ON HIS PAW. Maurice climbs the big hill for a better view, and strangely, the crystals are everywhere in the air and covering the ground. It's beautiful! This must be the something special everyone told him was coming. The little cub scoops up a ball of snow, wraps it in his red scarf, and sets off back to the den to show his Spring to Mama, looking like a little Santa with his pack. But Mama is sleeping too deeply to wake, and little Maurice himself suddenly feels very tired. Putting his snowball bundle beside him, he snuggles up beside Mama and sleeps, too. After a long sleep, Maurice wakes up with Mama. "I BROUGHT YOU SOME SPRING!" MAURICE ANNOUNCED. But Maurice's snowball is gone! Has he missed Spring? Not in Carin Berger's Finding Spring (HarperCollins, 2015), when Mama and Maurice head outside to see what spring has done to their forest. The white snow is all gone, birds are busy, and buds are flowering all over the big hill. AT LAST, HERE IT WAS! With a literary nod to Ezra Jack Keats' The Snowy Day and Raymond Briggs' The Snowman, Carin Berger concentrates on the coming of spring, saving the best--her gorgeous cut-paper collage art--for the beginning of spring. Berger's use of ephemera--scraps of script-filled handwritten notes, newsprint, bits of books, fabric, ticket stubs, and cut strips of of art paper--gives her illustrations a three-dimensional weight, whether picturing the tall, mossy-trunked trees of the forest, the variety of cut-out snowflakes, or the fields full of spring flowers. Even the youngest preschoolers will know that a snowflake is not a sign of spring and will giggle at Maurice's naivete' as he wraps his snowball to keep for Mama. 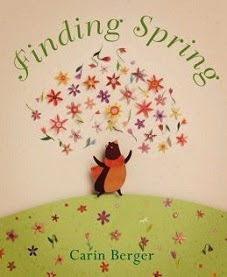 With shelves full of books about the cycle of the seasons and the glories of spring, this one is a standout. "Exceptional, exhilarating artwork perfectly suited for a story about anticipation, discovery and joy," says Kirkus Reviews.